I was still curious (hee hee), started looking for more Harrison Hudson music online and on Spotify, and enjoyed what I heard. I discovered that Harrison Hudson is a band made up of Harrison Hudson (guitarist, songwriter, and professional photographer) accompanied by Shaun Rawlings (keys and drums, I think)…but there’s just not a lot of information readily available. I began following him/them on Twitter, and learned that they have weekly internet shows (every Tuesday evening) hosted on StageIt.com. StageIt describes itself as “an online venue where artists perform live, interactive, monetized shows for their fans directly from a laptop, offering fans unique experiences that are never archived.” You purchase a “ticket,” and then tune in on your computer when it’s time for the show. There are a limited number of tickets for purchase, to preserve the intimacy and quality of interaction between the artist and the fan. There is a “chat” feature, like instant messaging, which allows the attendees to chat with the artist, request songs, and interact with each other. The artist performs in a bedroom or a living room, in front of his or her webcam, and the attendees watch the performance, which lasts about thirty minutes. I purchased my ticket and tuned in, along with about seven or eight others, to watch Harrison Hudson play guitar, Shaun Rawlings play keys, and entertain us all with their music and senses of humor. It was such a fun experience, I definitely plan to tune in again. 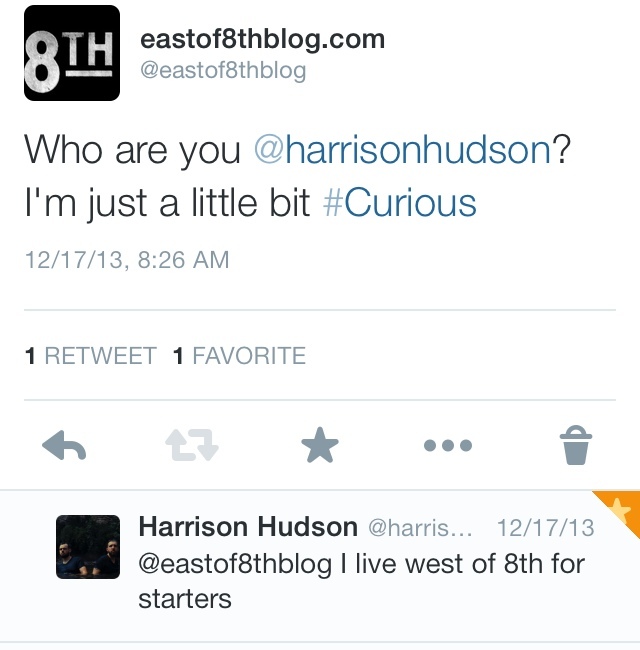 Harrison Hudson’s 12-song album Curious was released in September 2013; the album seems to be as elusive as its creators, with little in the way of reviews to be found. Fortunately, Harrison Hudson was generous enough to share the album with me for review (thank you by the way). The first track, “Around You,” about a relationship that has the singer’s head spinning, has a bouncy bongo beginning and guitar riff that playfully accentuate’s the song’s subject matter. “Being Me,” is a Ben Folds-esque tune about the singer’s difficulty with everything from awkward conversation to just being himself in this world (and by Ben Folds-esque I mean a cheerful song with a prominent synth-y/piano sound that has tongue-in-cheek lyrics; actually, I did a double-take at first because Harrison Hudson actually sounds a whole lot like Ben Folds in this song. Definitely a compliment.) “Fire And Fizzle Part One,” and head-bobbers like “You Don’t Love Me At All” and “Heartache Emergency” have a vintage tinge and evoke images of a pompadour-sporting crooner singing to his earth angel, or to one that seems to have flown away. The album’s high points are “Love Me, Love Me,” and “Curious.” “Love Me, Love Me,” with its funky guitar rhythms and rollicking beat, is a plea for affection, with lyrics like “love me, love me, why doesn’t that work/I write you ten songs but your head doesn’t once even turn.” I also thoroughly enjoy the angelic and dreamy background vocals in this song, bravo to the contributing songstress. The wonderfully clever “Curious,” the song that piqued my interest, and my favorite one on the album, begins with buzzy, echoing guitar, those angelic background vocals again, and a pulsating drumbeat. I love the lyrics here; he is curious about a potential love, he doesn’t know if it will be good for him, but he has to find out, wanting “to know for sure if you kill or cure..ious, I’m just a little bit curious” (see what he did there). It’s refreshing that all the songs on this album have something different to offer the listener, no song sounds like another. I like it.